Complete with new characters and New Super Luigi U DLC! New Super Mario Bros. U is getting a new lease of life with a “Deluxe” version of the game hitting the Switch on January 11th, 2019. Initially released on Wii U in 2012, New Super Mario Bros. U is the four instalment in 2D, side-scrolling action series. The platformer was well received by critics and in 2013 (as part of “The Year of Luigi”), a DLC expansion called New Super Luigi U was released. The DLC set Luigi as the main, playable character and tweaked the game’s levels for his unique abilities. The Switch release of the game includes the original game as well as the New Super Luigi U DLC. Also included are Nabbit and Toadette as playable characters along with Mario, Luigi and Toad from the Wii U game. Nabbit doesn’t take damage from enemies whereas Toadette transforms into “Peachette” with the Super Crown power-up. Peachette can double jump, slow float while falling and a will get a boost back up if she falls into a pit. With the additional characters, New Super Mario Bros. U Deluxe supports full, 4-player local co-op with a single Joy-Con each and one console. 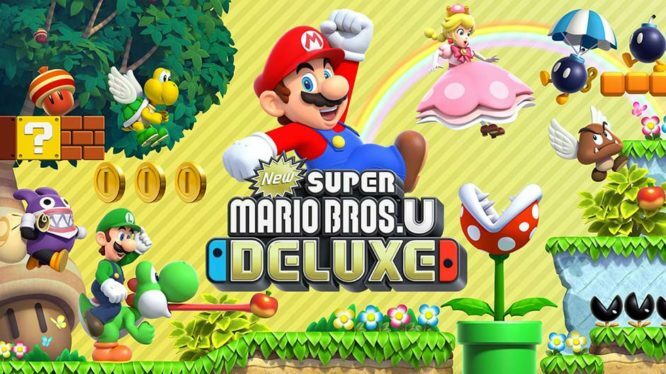 Nintendo Switch owners can start jumping their way through all 164 courses the game has to offer when New Super Mario Bros. U Deluxe hits the eShop and store shelves on January 11th, 2019.